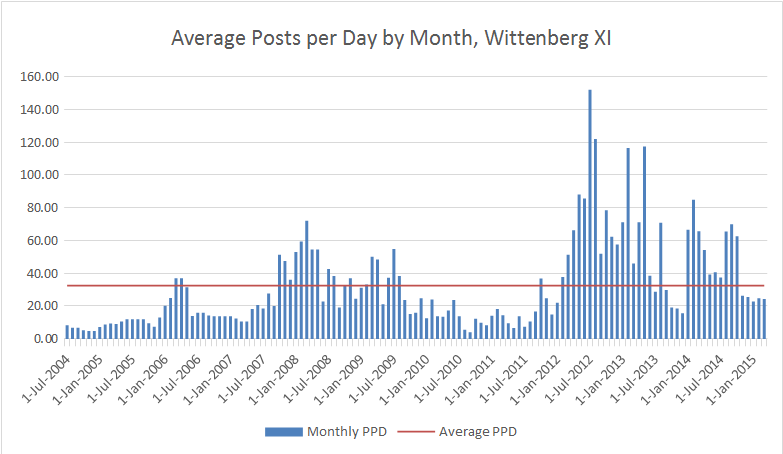 In our last issue, we looked at posting levels on Wittenberg XI (the current Proboards incarnation of Wittenberg) over the last four Cosa terms (including the first four Clarks of the current 47th Cosa). This article will survey a broader range of Wittenberg history—going all the way back to the establishment of Wittenberg VIII in June 2001. That’s almost 14 years, or just over 5,000 days, of Wittenberg. Because this range extends back well before Reunision, this survey will include all available incarnations of Wittenberg during the covered timeframe, both Kingdom and Republican. After all, posting activity on Wittenberg XI since Reunision has included the contributions of Seifeteir and Reviensadeir alike, so the most useful historical comparison is to the pre-Reunision activity of both communities. For additional comparison purposes, however, I have prepared some charts based on Wittenberg XI considered in isolation. Data for the various incarnations of Wittenberg were gathered from a variety of sources, including the Wayback Machine, Martì-Pair Furxher’s Wittenberg VIII archives on Talossa.ca, personal notes of the author from 2007-2008 and 2012-2015, and a total post count and last post date for Wittenberg XII(b) graciously provided by Dieter Vercaria. 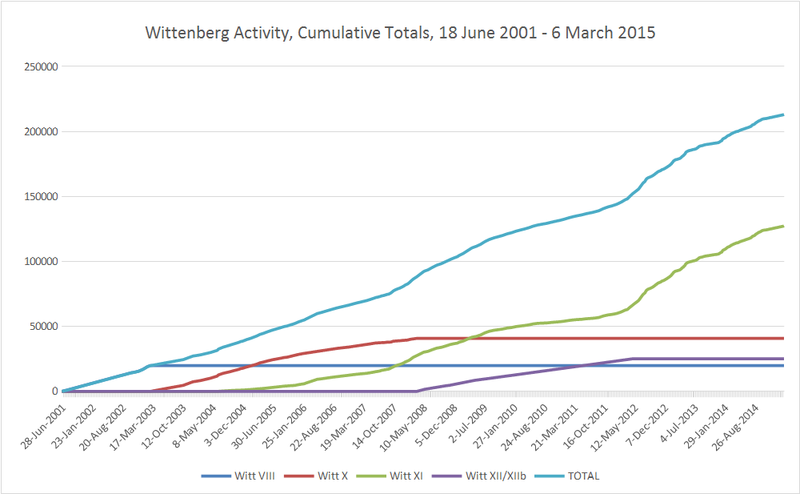 No data was available for Wittenberg IX, but that forum was only active for a few days in February 2003, and contained a negligible number of posts. Naturally, there are gaps in the data, but no gap in Witt XI after early 2007 is longer than about 2 months. However, I obtained data points to fill a large gap in Wayback Machine data for Witt XI between 2008 and 2011 by using post ID numbers from selected dates during that period. Due to discrepancies in how deleted posts are represented in the different data sources, this creates something of an artificial dip in posting activity in mid to late 2011. I filled in all gaps between recorded data points using linear interpolations from known post counts on each side of the gap. This has the most pronounced effect on the data from Witt XII/XII(b), where no Wayback Machine captures are available after 12 August 2009, so the Witt XII/XII(b) history appears as a smooth straight line between that date and the last recorded post on 22 April 2012. 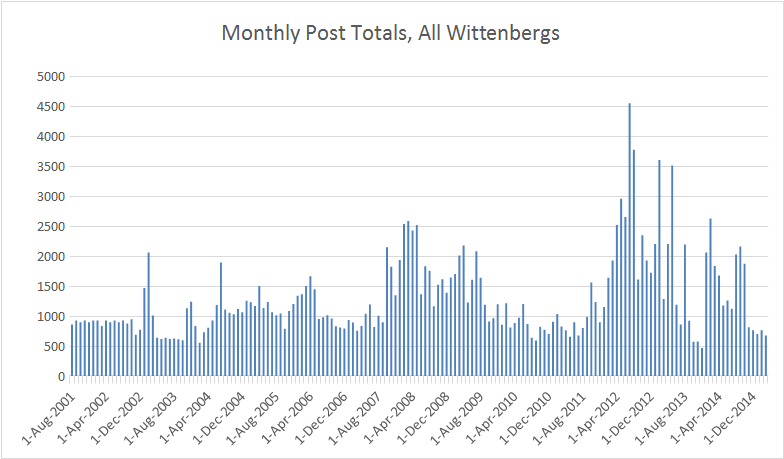 Also, the posting history for Wittenberg VII (June 2001 – February 2003) appears unusually regular due to an almost-15-month gap filled in by linear interpolation. 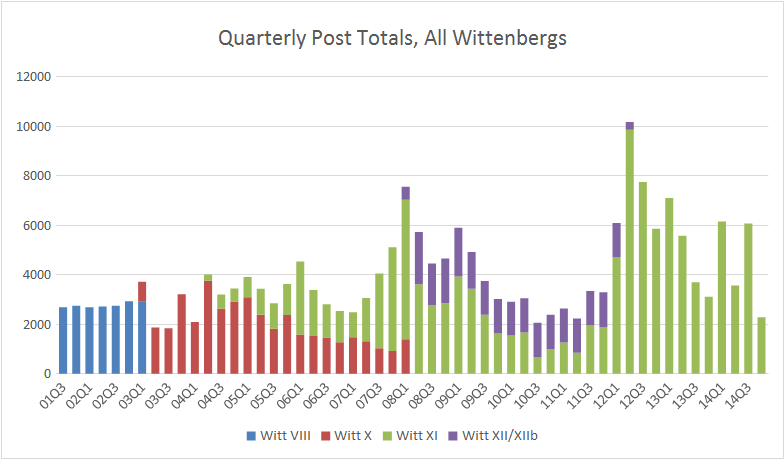 The “Quarterly Post Totals, All Wittenbergs” chart provides a visual depiction of the distribution of posts among the various incarnations of Wittenberg over time. 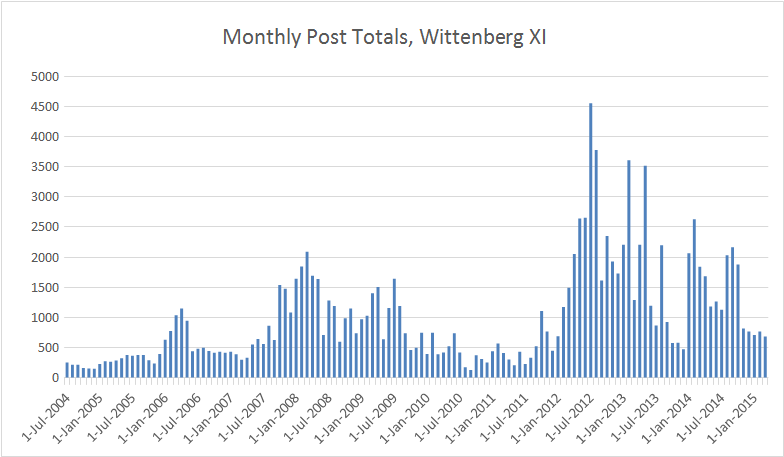 Due to the significant amount of linear interpolation used to complete the Wittenberg XII/XII(b) data, however, the proportion of posts attributed to Wittenberg XII/XII(b) from the 3rd quarter of 2009 through the 1st quarter of 2012 is unreliable. 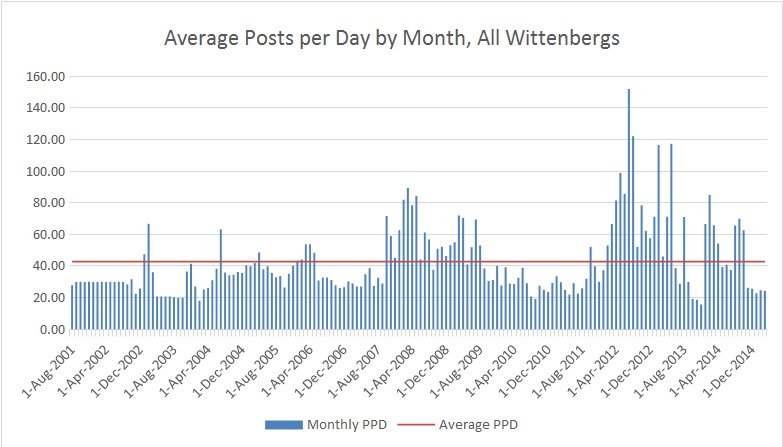 The “Per Capita Posts per Day, by Cosa Term” chart attempts to assess the relationship between population size and Wittenberg activity over time. Each Cosa term is measured from Balloting Day for that Cosa, as the per capita calculations are based on the number of eligible voters reported for each election (and the current number of non-Dandelion citizens for the 47th Cosa to date). The average posting population during a Cosa term is assumed to be the average of the number of eligible voters during the election for that Cosa and the number of eligible voters during the election for the next Cosa (number of eligible voters for the 33rd Cosa election is averaged from the neighboring elections due to incomplete TalossaWiki/Talossa Database System coverage for that election). Because applicable population figures are available only for the Kingdom, per capita posting rates are calculated using only Kingdom Wittenbergs (Wittenberg VIII, Wittenberg X through 1 June 2004, and Wittenberg XI). While it appears that per capita posting rates for the past three terms are below the long-term historical average (and significantly below, in the case of the current term), it must be remembered that recent population figures are inflated because no strikes were assessed in the past two elections. The population is likely to drop significantly after the next election, and the new population level may provide a better basis for historical comparison.